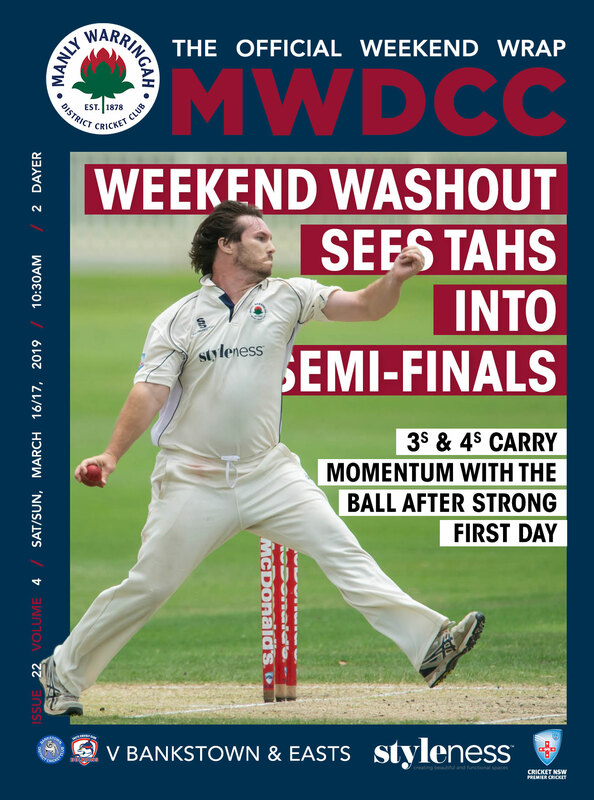 Week 1 of the Men’s Quarter Finals were predictably washed out across all matches across the 5 grades, resulting in all of the 4 top ranked teams in the 5 grades progressing to next weekends Semi-Finals. This includes our 3rd and 4th grade side who finished 3rd and 4th respectively. Both sides had a good Saturday. Manly Oval was amazingly available from ball 1 despite the rain over the previous few days, and we got a good day of cricket in. Bankstown were 2/132 at one stage but a great comeback saw then dismissed for 233. We managed to survive the day with the bat to finish on 0/14. Over at Trumper, skipper Gummer won the toss and decided to bowl, and we were able to restrict Easts to 7/85 after a late start. Both Women’s games on Sunday were completely washed out with no play possible. 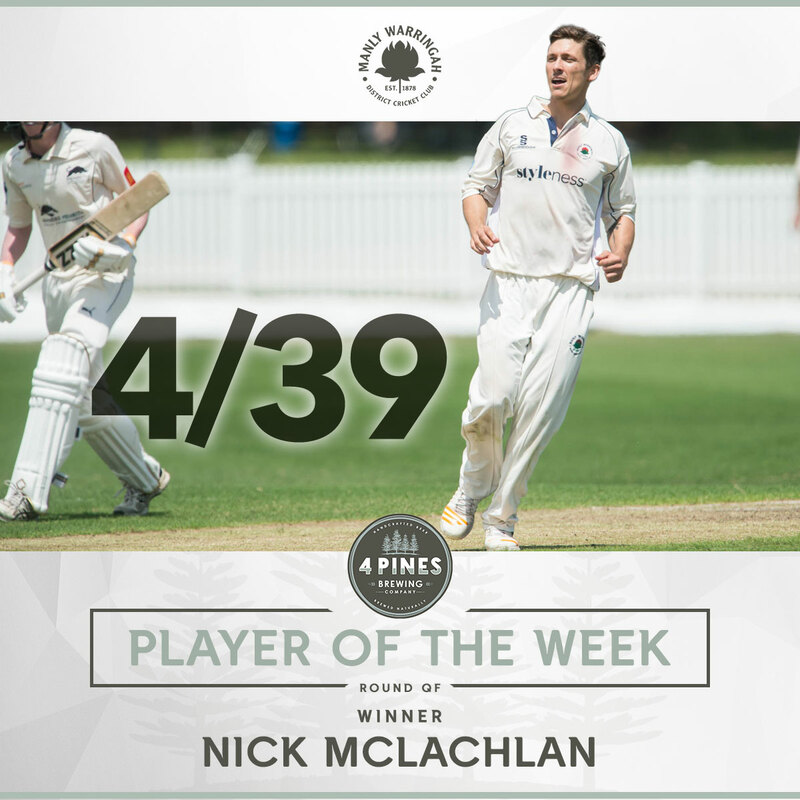 Our 4 Pines Player of the Week is the vivacious Nick McLachlan. Nick has been a revelation in leading 3rd grade this year, both as the skipper and with the ball. He has now taken 33 wickets for the year at an average of 15. He showed all his class on Saturday. Against a string batting line-up and a good pitch, he was a threat every time he had the ball in his hand, generating good pace and smartness. As the 3rd grade side go deeper into the finals, Nick will be an important cog in his sides wheel with both bat and ball. 3rd Grade turned up to Manly Oval expecting a long day on the sideline waiting for the ground to dry. But what we got was a great wicket and a good outfield, with the game starting on time at 10.20.
Credit to the ground staff my be given, we were all very surprised. Winning the toss and making first use of the ball, we were hoping to take advantage of the new ball and the bit of movement in the deck, but Bankstown got off to a good start and moved to 0/49 fairly comfortable. However Michael Counsell came on first change and got 2 wickets in his first spell, and at 2/73 the match was well poised. The Bulldogs then got on-top with a good partnership and again at 2/138 it was the opposition on top. However 2 wickets on 138 from Hicks and McLachlan started a slide for Bankstown to fall to 7/168, eventually recovering to 233. Left armers Nick McLachlan with 4/39 and Michael Counsell with 3/45 were the pick of the bowlers. We faced 7 overs at the end of the day with Matt Brewster successfully negotiating a tricky period to finish on 0/14. However the downpour on Saturday night and Sunday morning meant that there was no play possible on Sunday. But with all other games also washed off, we progress to the Semi-Final next wee and take on Easts at Waverley Oval. 4th grade took on Easts at the always pretty Trumper oval over the weekend in a 3rd vs 4th tussle. However after a fair amount of rain over the previous 2 days, we were delayed due to a wet outfield. Full credit to Doug McGrath for his work on the super soper, showing up both teams and everyone that was more than half his age. We eventually got on at 1.30pm and with sipper Gummer winning the toss, we were confident of a god start with the ball. Somerville got us going in the first over with an LBW, and then took another shortly after to have Easts on the back foot at 2/12. From there it was a fairly consistent flow of wickets. Jacob Graham again bowled well and took 2/11 off his 7 overs, with Wigney and Moffat also performing well with the ball to pick up a wicket each. With the day finishing at 7/85 after 39 overs, we were in for an interesting Sunday but unfortunately the down pour of rain meant no play was possible.